A package for the more experienced riders with very good fitness. We do half-day and hole-day riding-tours in Ammarnäs forest and mountain range, where the main ride is an extraordinary day to the mountain lake Dauta. Riding is over 3 swedish miles with steep hills both up and down so the ride is nothing for "anyone". Arrival at Ammarnäs, check in between 15-20. You stay the night in one of our cottages at Hedebo farm. No meals included. Self-served breakfast in the cottage. In the morning we go to Ammarnäs for a guided tour at the Visitor Center "Naturum" between 10-11 am. Then we head to the horses and ride a little longer township tour, we finish with riding the horses to Hedebo Farm. Woodheated sauna is available at Hedebo farm, for self-catering. Breakfast and sandwiches are included. You stay the night in one of our cottages at Hedebo farm. Self-served breakfast in the cottage. 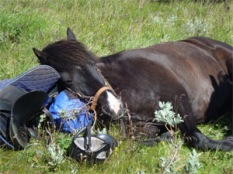 Extra long day trip on pur islandic horses. 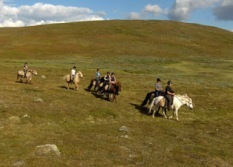 We meet early (around 08 am) and arrange the horses and then continue up to Björkfjället and the mountain lake Dauta. During the trip we try both tölt and canter. 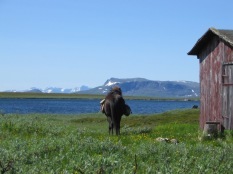 We are heading for our outdoor lunch under the sky at a wooded hill, just above the reindeer corall in Biergnes. After lunch, we will continue the ride on Björkfjället and after a while we will make a stop at the mountain lake Dauta for a rest and a little energy-enhancing snack. Then we continue the ride with a beautiful beach galoppe of about 200-300 m, along Dauta's sandy beach. Although the beach is not particularly wide, it is an experience that many appreciate. We will continue on the mountain for a while before we begin our journey from the mountain and take us back to Ammarnäs. Wood-heated sauna is available, on Hedebo farm, for self-catering. Breakfast and lighter lunch included. You stay the night in one of our cottages at Hedebo farm. 30-35 km riding / 7-8 hours in the saddle. Self-served breakfast in the cottage Prolonged halfday tour on islandic horses in the morning. After the ride it´s nice with a bath in a wood-heated hot tub at Hedebo Farm. Grill dinner in the lappish tent in the evening. Breakfast, sandwich-lunch and barbecue dinner are included. You stay the night in one of our cottages at Hedebo farm. Basic price: 6.950 SEK / person incl. - you fill water and fire it up but we clean. * Be able to groom and saddle a horse by yourself.